Martin Dougiamas from Moodle HQ announced a new free cloud based hosting for small Moodle sites. MoodleCloud enables an individual who does not know how to install Moodle themselves, or does not have the money to spare, to get a small Moodle sitethat they can test out with their training group or class. The MoodleCloud service provides free hosting for an up-to-date Moodle site on https://yourname.moodlecloud.com You cannot change the URL. 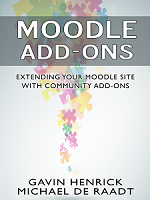 The site will always be running the very latest release of Moodle but with no hassle of upgrading – it will just happen. So no hassle, and no technical know-how required. Just fill in a form, verify you are you – and you got a small Moodle site. MoodleCloud is designed for smaller users. The system is free to use but the user numbers are capped at 50 – which is quite sufficient for a small class or test site. The space allotment is 200 mb – however this should quite a lot really. Moodle integrates with YouTube, Dropbox, Flickr, and many other content sites out there – so files can reside on those without impacting the install size of Moodle. The site is the core Moodle install, no extra plugins with one exception – BigBlueButton – an excellent open source video conferencing tool – which this limited version will cater for 6 people in a session. Again, quite enough to test with or use in a small discussion. It is free to the teacher, but someone has to pay – so there are some Google ads in the footer of most pages on the site. Not too intrusive really. Something that while running a small class or trial site is not a turn-off. The service uses a mobile number to verify that you are real. This works two ways – firstly, it sends you a code to confirm your setup request. Also once you have successfully set up a site you cannot use your mobile to make another site. Just one Moodle 4 u! Moodle 2.2 supports connecting to IMS LTI tools. This entry was posted in Moodle and tagged Cloud, Free, Hosting, Moodle, Small, Teachers. Bookmark the permalink.